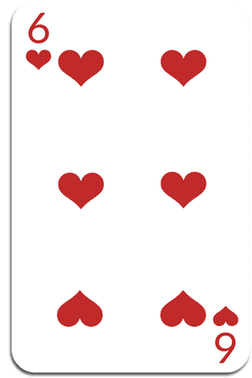 "The Six of Hearts card is destined to be loving and passionate yet task and action-oriented. They can put their passion behind their goals and accomplish amazing things in this lifetime. Six is a number of service and duty, and the Heart suit represents people and love. So while Six of Hearts will be successful in career endeavors, they will also be deeply caring and demonstrative with their loved ones. The balance they can achieve through this is something we can all try to mimic. Six of Hearts are clear thinkers and bring a sense of calm and sanity to any situation. Telling them you entrust yourself to them gives them deep satisfaction and reward, as they are the quintessential Nurse or Mother archetype. They make others feel safe with their attentive natures, and grounded approach. Throughout their lives, they experience many destined relationships which may take the form of a mentor who shapes their life or a soulmate. This could even take the form of a lifelong search for a partner. These relationships and that potential search create..."
*​​BTW: Scorpios have two (because it has two rulers).